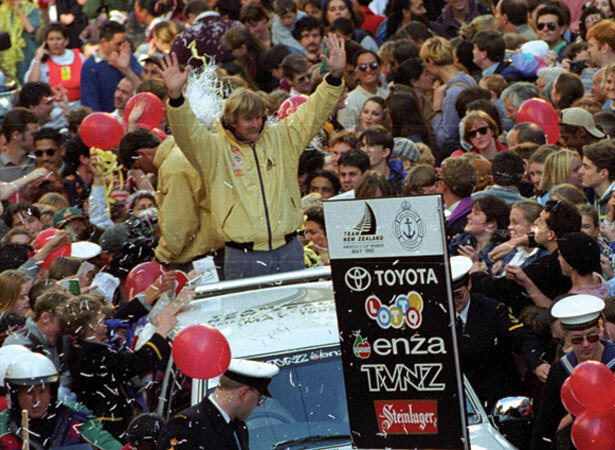 Few New Zealanders in 1995 could have avoided television commentator Peter Montgomery’s famous line, ‘the America’s Cup is now New Zealand’s cup!’ The phrase was repeated endlessly as New Zealand enjoyed one of its most significant sporting triumphs. The 5–0 sweep achieved by Black Magic (NZL 32) over Stars & Stripes in San Diego was impressive. Their opponent, the controversial American helmsman Dennis Conner, was a four-time winner known as ‘Mr America’s Cup’. Team New Zealand had made the finals of the Louis Vuitton challenger series in 1987 and 1992. In 1995 syndicate head Peter Blake assembled a dream team of New Zealand sailors. An extremely fast boat was superbly sailed by 1984 Olympic gold-medallist Russell Coutts, ably backed up by the astute tactician Brad Butterworth and navigator Tom Schnackenberg. Five years later, in Auckland, Team New Zealand became the first team from a country outside the United States to successfully defend the America’s Cup. A depleted Team New Zealand was well beaten by the Swiss syndicate Alinghi in 2003 and mounted unsuccessful challenges in 2007 and 2013. In 2017, Emirates Team New Zealand regained the America’s Cup by defeating the holders, Oracle Team USA, 7–1 in a series contested by foiling catamarans on Bermuda’s Great Sound. We have 1 biography, 1 article, related to New Zealand wins the America’s Cup .